We are dessert lovers! I mean I am really not kidding you when I tell you I work out so I can eat dessert. I will work out for an hour so I can eat a piece of cheesecake without feeling *too* guilty. I have learned that life is not meant to be free of dessert so we should indulge on occasion. But I also know that life is about balance, so I can’t eat cheesecake every day and not suffer the consequences if I am not working out. I like a sweet after dinner, but on most days it is a biscotti. However during the holidays I make a Cheesecake. And not just any old cheesecake. I usually make my Ultimate Turtle Cheesecake. Preheat oven to 350F. Line a 9×13 baking pan with foil, with ends extending over the sides of the pan. Grease the foil. Microwave chocolate and butter in a large microwavable bowl on high for 2 minutes or until butter is melted. Stir until chocolate is completely melted and mixed with butter. Stir in sugar. Blend in eggs and vanilla. Add flour and salt, mix well. Spread into prepared pan. Bake for 30-35 minutes or until toothpick inserted into center comes out with fudgy crumbs. It is important not to overbake the brownies as they will be going back in the oven in the cheesecake batter. Cool brownies on wire rack in pan. Once brownies are cool cut them into ¾ to 1 inch cubes to put into the cheesecake batter. You will have more brownie than what is needed for the cheesecake batter. It is up to you what to do with the leftover brownies. (wink wink) Although next time I will crumble some of them up and put them on top of the ganache of the cheesecake. I mean is anything really too extra at this point with this cheesecake?? I think not. Stir the ingredients together and then press into the bottom and up the side about an inch of a buttered 9-inch springform pan. Beat cream cheese on low until creamy (if you want a nice thick New York style cheesecake, be careful not to mix on high because that will incorporate too much air into mixture). Once cheese is creamy, add eggs in one at a time and incorporate into cream cheese. Add vanilla, sugar, lemon juice, sour cream, beating on low speed until each ingredient is mixed in, scraping down bowl between additions. Fold brownie cubes in very gently and pour mixture into prepared pan. Put springform pan in a shallow baking pan, (this will catch any spillover) in the middle of the oven and bake for 45 minutes or until cake is set 3 inches from edge but center is still slightly jiggly when the pan is shaken. Grind the chocolate into powder in a food processor. Scald the butter and milk in a saucepan. With the machine running, pour the hot milk/butter into the food processor with the chocolate. Blend until chocolate is smooth. Add the vanilla and sugar until smooth. If needed add more powdered sugar until desired consistency is reached. 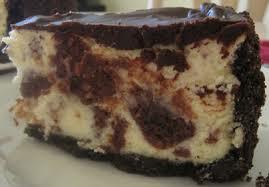 Spread over cheesecake while chocolate is still warm. Chill until ready to serve. This cheesecake was absolutely amazing! 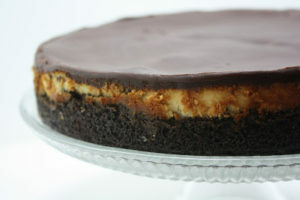 It was delicious and creamy and decadent and everything you would want or desire in a cheesecake or a special dessert! I hope you love this decadence as much as we did! It will take me a month of working out to work it off, but man oh man it was worth EVERY drop of sweat!